A 260-room resort classified 4 stars. It opened in 1992 occupying 6800. It enjoys a prime waterfront location with 350 meters of sandy beach, magnificent views of the sea and outstanding opportunities for aquatic and sport activities. It lies on the Red Sea touristic promenade, 10 km from downtown, and features unique facilities such as two submarines, marina, a shuttle boat and a man-made island. 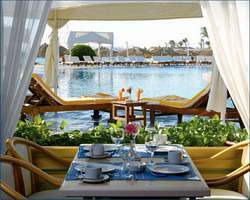 The Sindbad Beach Resort Hurghada offers the guests meals in an in-door restaurant and / lounge along with a coffee shop , in order to give the guests a feeling of intimacy and home away from home. The Sindbad beach resort offers many facilities through their multilingual staff: international animation program performing live entertainment, a heated swimming pool with water slides, floodlit tennis courts, volley ball, giant chess, billiards, table tennis, diving and aqua centre, water sports, windsurfing school, fishing, boat rental, bike rental , health spa / massage, beauty salon, a disco, a shopping arcade, games Room, playground Area, child/Baby Crib, childcare/babysitting. What really distinguish the Sindbad Beach Resort Hurghada is its unique submarine, for those who prefer to be kept dry and still discover the impressive under water paradise of the marine life of the Red Sea, it is highly recommended to take a half day tour in this yellow submarine, to live this memorable experience.